Cameron partnered with seven different organisations to support this incredible challenge in order to raise funds for CanTeen – a registered New Zealand charity helping 13-24 year olds affected by cancer. The organisation raises funds and awareness to support these young people. Cameron had a personal motive to support this particular charity – his 13-year-old New Zealand cousin was receiving treatment for Hodgkin’s Lymphoma, a type of blood cancer. The ambitious adventure started in Cape Reinga on Tuesday 18th July 2017 – Cape Reinga is a sacred Maori site and the place where Pacific Ocean collides with the Tasman sea and it was from here that Cameron set off in the wind and rain heading southbound towards Auckland on the Highway 1 – a busy road with huge logging trucks hurtling past at speeds of up to 100km p/h and little room to pass. Although Cameron did his best to avoid this treacherous stretch of road and rerouted to minor roads, he encountered further challenges when the battery on his phone died and he found himself redirected onto rural country lanes by his Wahoo GPS where he was attacked by a farm dog. Fortunately, Cameron was able to fend off the dog, but in the process injured his knee and was left in agonising pain with a long distance ahead to the nearest town and no food. Luckily, he made it to the town of Kaukapakapa just outside of Auckland and was able to recuperate and recharge his phone and contact his wife Alice, who arranged accommodation along the way. His journey continued into Auckland where his painful and inflamed knee was treated in an Acupuncture Centre with Chinese herbal patches and cupping. From there Cameron travelled on passing through the following towns amongst others; Pukekohe, Tokoroa, Lake Taupo, Turangi, the magical Desert Road and its stunning scenery, through Palmerston North and into Wellington before catching the ferry to cross over into Picton on South Island – an incredible land characterised by dramatic scenery and extreme weather conditions. Cameron’s South Island adventure seemed to be the place he really found his cycling rhythm – his experiences on the North Island had taught him some valuable lessons which helped him to establish a good daily routine – this consisted of riding 60 – 80km before stopping at a coffee shop, then continuing on for another 100 – 130km before lunch and then onwards from there. His journey took him from Picton to Nelson, onto Reefton and Ross before heading into Greymouth, where he met with a journalist from the Greymouth local newspaper, the paper had contacted Cameron and was interested in writing a story on his bike adventure. Cameron arrived in Greymouth cold and drenched due to the cold lashing rain he had been riding in, so his wife Alice gave the interview on his behalf while he changed and dried off. Leaving Greymouth in the pouring rain which showed no signs of subsiding, Cameron was merely a few hundred metres down the road when he took his first and only fall – his bike wheel became wedged in an industry rail track which was cut diagonally across the road causing him to come crashing to the ground. Luckily Cameron avoided serious injury and suffered only superficial grazes and bruising, the bike however wasn’t so fortunate and needed some urgent repair work. An employee from a local bike shop was kind enough to fix the bike immediately and without charge when he learned the tour was raising funds to support CanTeen. From there Cameron soldiered on determined to meet his target, passing through Hokitika, Ross, Whataroa and Wanaka before heading into Queenstown. During this lap of the challenge Cameron travelled in extreme sub-zero conditions battling icy roads and gusty blasts of wind all made even more challenging by his extreme fatigue from days of constant cycling and pain caused by overuse injuries. This stretch of the journey did however bless him with three glorious days of sunshine allowing him to soak up the spectacular scenery of the region as he peddled. 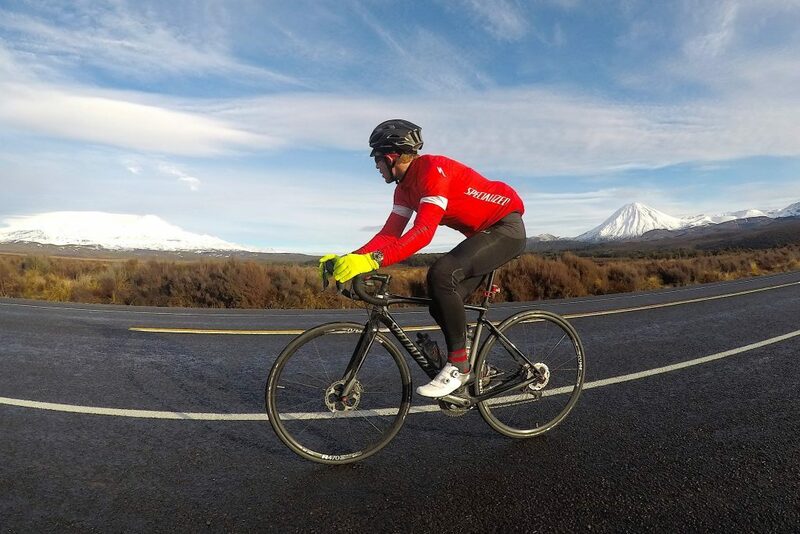 The final 270km leg of the journey from Wanaka to Bluff involved climbing over 2000 metres in -5°c, where even his two water bottles froze solid, before making it down into Bluff – a historic port located at the Southern tip of New Zealand’s South Island. All in all, Cameron’s adventure involved exhilarating cycling in some of the most mind bogglingly beautiful locations on the planet – incredible stretches of roads surrounded by diverse and majestic landscapes. Not to mention the numerous challenges he encountered on the way – riding back to back for days in wintery torrential rain in saturated clothes feeling chilled to the bone, tackling the steep hill climbs in rain and hail with a strained ligament in his knee from the dog attack, the intimidating presence of supersized trucks flying by at high speeds, punctures and other bike problems, a fall in the heavy rain and the sub-zero temperatures of the South Island. A truly awesome accomplishment and inspiration for other keen cyclists! Read Cameron’s blog over at Bike Chaser for a more in-depth account of his incredible experience.